Note the very distinctive white flash above the eye and the brown neck, head and breast of this male Garganey. The Male Garganey has a bold white stripe above the eye, it's head and body are mostly brown with light grey flanks and wing feathers. 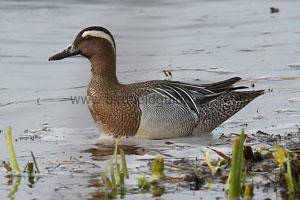 The Garganey is a Summer visiting, breeding duck to the UK and Europe, spending it's winter in African regions. Around 100 pair nest in the UK. The Garganey nests on wet, grassy, freshwater marshes. On migration it can be found on almost any kind of freshwater but mostly on lakes and reservoirs. A surface feeding duck the Garganey often associates with other ducks such as the Teal when on migration. The Male Pintail in Autumn has no bold white eye stripe and he becomes mostly brown like the Female. The wings and flanks however retain the same grey breeding plumage. The Garganey is unique in the UK being the only Summer visiting duck so is not often seen in it's winter plumage in the UK. The Female has a similar wing pattern to this but the grey is much browner. 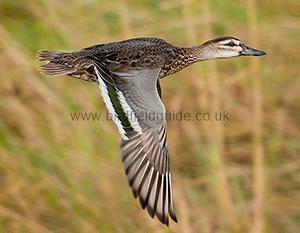 The female Garganey has a similar wing pattern to the Male when in flight, except the light grey forewing is much darker and more brown. The two white wing bars on the upper wings are slightly broader than the Males.